The problem with meeting up for pre-drinks at 6pm for an event that begins at 5pm is the inevitability of your own lateness. And so, like any good journalist with a sturdy disregard for professionalism, an early evening cocktail of rum, red wine and gin & tonic finally leads me into the spider’s web at around the quarter to eight mark. Entering Queen Square via the Hole in the Wall entrance on Bell Avenue, the huge mechanical arachnid looms ahead of me, a stagnant 50 tonnes of ex-military scrap metal, a slumbering mass of nascent menace. After a six year tenure at the Glastonbury Festival that has seen its performances become one of the most fun and sought after attractions during those June evenings at Worthy Farm, news of Arcadia Spectacular’s visit to Bristol created a stir throughout the city and over 20,000 people were expected to engulf the historic square over the course of two evenings; last night’s event had already seen a line up featuring Roni Size Reprazent, Leftfield, Congo Natty but sadly was bereft of 73 year old local celebrity DJ Derek. Now missing for over six weeks, hopes for his wellbeing seem to erode by the day; his name was kept on Friday’s bill and a DJ set featuring music that he would have approved of was performed in tribute. After sets from Brisfest’s warm up DJs followed by house and bass duo Gotsome earlier in the evening, I join the vast gathering of humanoids during Monki’s set, a DJ who has developed a reputation as an underground tastemaker in her championing of new electronic talent on her Radio 1 show. Amidst a sea of Saturday night socialising, the music is occasionally rendered an incidental backdrop to nonsense chat and drunken hijinks; however, my ears perk up to the sound of SL2’s ‘On A Ragga Tip’, a slice of comic nostalgia that somehow manages to be both laughably bad and a sure-fire catalyst for impromptu boogieing. M Beat’s ‘Incredible’, featuring General Levy and the refrain “Jungle is massive”, is another familiar 90s throwback and, as the sun begins to set, we hear the ska reggae groove of Toots and the Maytals’ “54-46 Was My Number”. Then, with Queen Square now succumbing to nightfall, it’s time for the evening’s flagship performance of Arcadia’s ‘Metamorphosis Show’. A booming voiceover from the heavens provides the dystopian backstory of giant, malevolent spiders ravaging Planet Earth, abducting humans and transforming them into enslaved spider-hybrids. 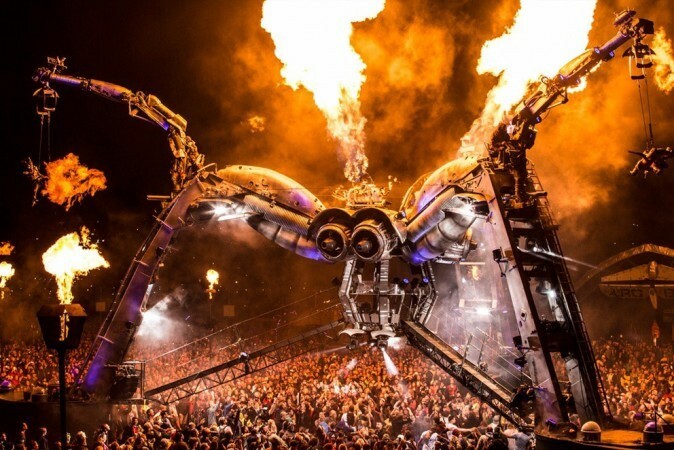 The gradually emerging sounds of cinematic electronica build tension before the giant metal spider comes alive in a stunning display of light and sound; its large eyes glow red, it limbs begin to move and acrobats in tight silver suits rapidly traverse its mass and hang face down towards the ground. The spider then makes a three pronged grab for victims; it plucks a triumvirate of actors from the ground, panic and desperation causing them to flail around in the grip of the beast, before being cocooned in pods and fed to smaller spiders that eerily creep across wires to collect their pray. The visual extravaganza is embellished by a frenetic light show and, in keeping with Bristol’s standing as European Green Capital 2015, a fireworks display resulting from the world’s first recycled biofuel pyrotechnics system. There’s also the incredible spectacle of tesla performers in Faraday cage suits channelling an apparent 4 million vaults in electricity from their heads and hands. The stunning visual display comes to an end with huge jets of fire shooting out from the top of the spider’s head, temporarily illuminating Queen Square in its glow and causing those even at the perimeter of the venue to feel the warmth on their faces. The music continues with local DJ and producer Eats Everything who steers the audience away from a potential stunned post ‘Metamorphosis’ stupor with some crowd pleasing UK bass and house cuts. Considering the spoken for status of the nice young lady whom I had been talking to for some time and who eruditely provided me with “Faraday cage suits”, it’s time to make a beeline for the bar. There are reportedly 12,000 people in Queen Square this evening and it begins to feel like it as I wade through the mass of bodies on my search for refreshment. The bar is near deserted and lager at Arcadia is available in the form of cans of Red Stripe for £4 a time; pretty steep, as one would expect for such an event, but with the cosy convenience of being a sealed receptacle that can be stashed away in a rucksack for later consumption. My enthusiasm for negotiating the arduous route back to the people with whom I had been previously drinking has now deserted me, so I linger around the perimeter and arrange a rendezvous with a couple other friends. I join them as headline DJ, and recent inheritor of Zane Lowe’s primetime Radio 1 slot, Annie Mac sees out the evening with her set. Perhaps fittingly, she closes a highly enjoyable evening with local heroes Massive Attack’s ‘Unfinished Symphony’ and declares her love for the city of Bristol as thousands begin to head for the exits. Acardia Spectacular has provided a visually mesmerising and novel addition to the city’s summer programme. If Bristol can acquire a regular arrangement that sees the event’s annual return, it will be hugely worthwhile coup. Unfortunately with 12,000 people in one space, the sheer weight of numbers alone makes the hope of an event being completely moron free a highly ambitious one. Alas, my +1 for the event suffered the odious spectacle of having his leg urinated on by an imbecile. That one drawback aside, Arcadia Spectacular has provided a thrilling swansong for the summer. Tagged annie mac, arcadia, bristol, eats everything, queen square, review, scott hammond. Bookmark the permalink.